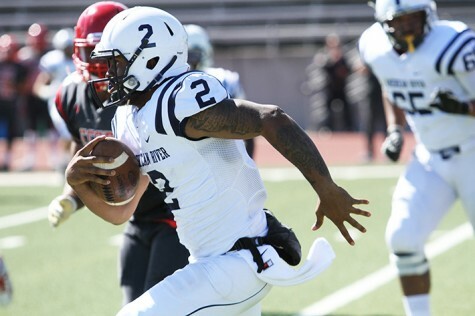 American River College quarterback Jihad Vercher grew up in South-Central Los Angeles. He said he focused on football and homework in spite of the sounds of gunshots in his neighborhood (Photo by Barbara Harvey). A previous version of this story falsely reported that “the … San Andreas area” was occupied by “Bloods, Crips and other gangs.” In fact, those gangs occupied the Los Angeles area. 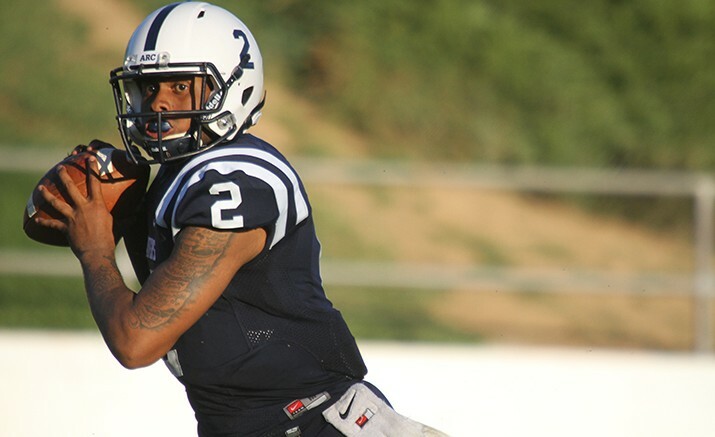 When he was six years old, American River College quarterback Jihad Vercher watched in horror as someone from his South-Central Los Angeles neighborhood was chained to a fence and shot dead behind his house. “That was the most traumatic thing I’ve ever seen in my life,” said Vercher. That was scary. Vercher, now the starting quarterback for ARC’s football team, grew up in eastern Inglewood. The neighborhood, and the ones surrounding it, were occupied by Bloods, Crips and other gangs from the surrounding area. Witnessing this killing influenced Vercher to focus his life on his schoolwork and football and to never venture far from his house. Vercher said that he was frustrated by this as a kid, but grew to understand his parent’s reasoning as he grew older and saw some of his friends go to jail or be killed by gang violence. The sound of gunshots was a common one for Vercher to hear at night, and he became accustomed to their constant presence as he grew older. As a child, however, he was always fearful that one of those shots were directed at one of his parents. Vercher joined his high school football team at Bishop Mora Salesian High School during his freshman year. Upon discovering that the team needed a quarterback, his father pushed him to step into that role. “He always thought that I could throw and always pushed me to play quarterback, but I never really got into it (before),” said Vercher. Vercher did not play extensively until his sophomore year when he threw for 1,937 yards and 26 touchdowns. He played football in all four of his years in high school, finishing with 85 touchdowns and 7,357 yards passing in his career. After his senior year, Vercher received offers from seven schools, including Cal, Eastern Washington University, the University of Idaho and Sacramento State. Vercher eventually orally committed to play at Sac State, a decision he said was influenced by the time that recruiting coordinator Aaron Ingram spent with him. Vercher, 18 years old at the time, lived in a dorm room with one of the team’s running backs but that even though he was around many people, he missed not being able to see his family. When he first moved to Sacramento, Vercher said that he noticed the difference between the two cities. While at Sac State, Vercher played his freshman year before tearing the patellar tendon in his right knee and redshirting his sophomore year. It was this injury, Vercher said, that caused him to lose his passion for the game of football. He thought his knee was never going to heal. He was released from Sac State prior to his junior season after appearing in nine games and throwing for 27 yards. On the day of his release, ARC football head coach Jon Osterhout called Vercher and invited him to visit and see the campus, which Vercher agreed to. American River College quarterback Jihad Vercher was invited to see the ARC campus by head coach Jon Osterhout. Vercher moved to Sacramento from Los Angeles when he was 18, initially attending Sacramento State University (Photo by Barbara Harvey). Despite his leaving, Vercher said he would not mind returning to Sac State. “He’s been really solid for us. He’s only going to get better. He’s got the keys to the car and it’s a nice car,” said Osterhout. After seeing the school’s athletic facilities, Vercher agreed to stay in the Sacramento area and play football at ARC. Vercher, a social science major, said he wanted to get into engineering before the season, but was told he could not due to time constraints due to other classes he was taking. Once done with football however, he said he will start to focus on it again. Dumetz said that when he first met Vercher, he never sensed any kind of distance between the two. Vercher, who has aspirations to go to the NFL, said that he wants to be drafted by his favorite team, the Pittsburgh Steelers. Through seven games, he has thrown 14 touchdowns, 1,440 yards and 5 interceptions for ARC. Be the first to comment on "ARC quarterback overcomes gang violence to become starter"